Wondering what is considered "to much" offset for a good Fitment on a civic? I'm looking at some 15x8 with a +15 offset wheels. My rears fenders have been rolled, thanks to Type Riki for the huge help. Any suggestions or personal experience of what is best to go for? What? "If you're running pretty wide wheels, negative offset can't be bad either probably up to -5 or -10" Do you not know how offset or wheel fitment works?? OP, you're probably going to have to measure out your wheel wells to see what will fit best, or at least what will fit up to your standards. Worst case if you can't figure anything out, even though it's really easy to do, you can always buy a higher positive offset and add some wheel spacers to get it to your liking. Well mike , Like i've told you I've ran 15x7 and 15x6 +2 offset and +15 on a 195-50 tire and I didn't have much issues. Tire size would also help the wheel fit a little better , but you'll need to roll and pull or get a camber kit . Sorry, should have been more specific, I own a 00 civic. My current wheels are +30, Id like to run a little bigger with 15x8 wrapped with 195/50R15. Just curious, do to such a low offset, if the lip would cause any damage to the fenders? What wheels did you run the +2 on? Only reason I ask is that'll make a big difference. Did you run that on the 6" or 7" wheels? I don't know the civic wheel wells at all and if someone can post a pic and tell me wheel specs that they ran I can quickly and easily tell you what offset you will need with an 8" rim to have it fit the exact same. Last edited by Ej6kev; 08/28/2013 at 10:50 AM. Sweet, so for the OP if you want the same fitment as what's pictured above with an 8" rim you would need to run a +14.7 offset or +15 like your initial thoughts were. Just might need to make sure that the inner side of the rim doesn't hit your suspension or body of the car and you're good to go. If you want the math broken down let me know and I'll show you how to do it if you don't know how to. More info here, a 15x7.5 with a 205-50 tire will hit the rear trailing arm so you might need to get a smaller tire. Unless you camber it. Can you give an example of what hits where exactly? I don't see how the tire hits but not the rim? Like said earlier though I don't know what the civic suspension is like so I guess this is probably something I would have to see to understand what exactly you mean. Whoops . I meant the rim itself. but it hits right on the side of the trailing arm. probably cause i'm at a high offset right now. and low offset i was fine. I'd told Kevin I'm in love with that Fitment lol but yes, I'm leaning towards doing 8" and the ET only come with 15. If you mind, I'd like to know how to measure everything to get the correct Fitment. As for tires, I believe it might stretch just a little bit, but not excessive. Yesterday, did a full wheel alignment and set my rears at 3.20 degrees. Would I might have to get it adjusted due to offset clearance?? I fit them in with natural camber. I never had camber kits. just put the smaller ones in back. Here's a quick rundown on how to do everything. I'm going to make this pretty dummy proof I'm sure you know a good amount but I like to make sure everything is gone over so it's very clear. First lets start with the rim itself and clarify some things. So that pic should make sense of everything, one thing I would like to point out is the RIM WIDTH, it's measured by where the bead seats not how wide it is from the outer edge of both lips. This will make a difference as the actual lip can be anywhere from .25" to 1". If I'm working with a wheel I don't know the thickness of the lip I always just assume it's going to be 1", better to be safe then sorry. So if you want an 8" rim you're actually looking at something that's going to be nearly 10" wide from edge to edge. So now that we have that cleared up let's get to measuring what you can/cant fit. For this you will need a tape measure and a straight edge (you can use anything that's straight, even a 2x4 as long as it's straight. Jack the car up, take a wheel off and set the car back down with a stand under the LCA holding the car up this way you will be at what your ride height really is as camber changes per suspension compression. 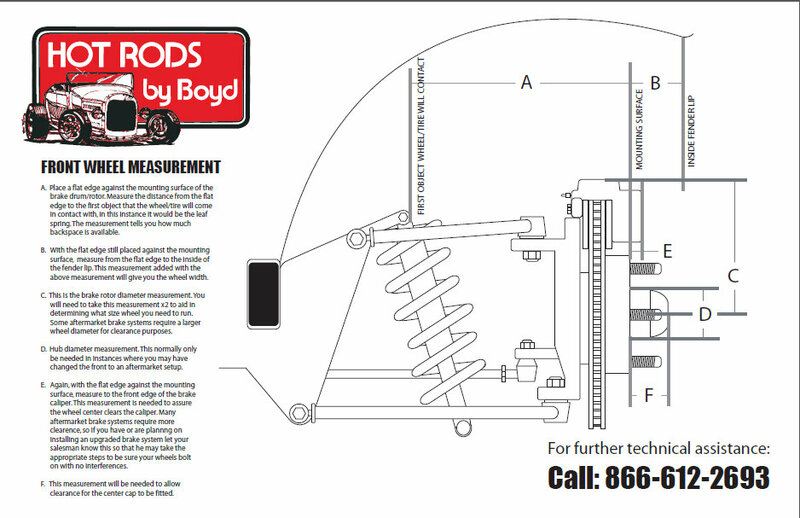 Set the straight edge up against the face of your brake rotor or drum WHERE THE WHEEL MATES. Then use your tape measure to measure where the nearest point of contact would be (Kevin said it's the trailing arm so measure there). Then right down the distance. This number will be what you can fit for the back spacing of the rim, then you can keep the straight edge on there and measure the distance from it to the lip. This is your "front spacing"
Now the last thing we need to do is all the math which is really simple. Let's check to see if these 15x8 +15 wheels will fit. Start with your rim width of 8". Now remember that's bead to bead so we need to add an inch to each side for the lip thickness. If you know your lip thickness is different add whatever the true thickness is. I'm just doing an inch to be safe. So let's say the true outside to outside wheel width is 10"
Check this with your measurements you took earlier, add what will fit for your front spacing and back spacing and make sure it's at least 10" If it is we shall move on. 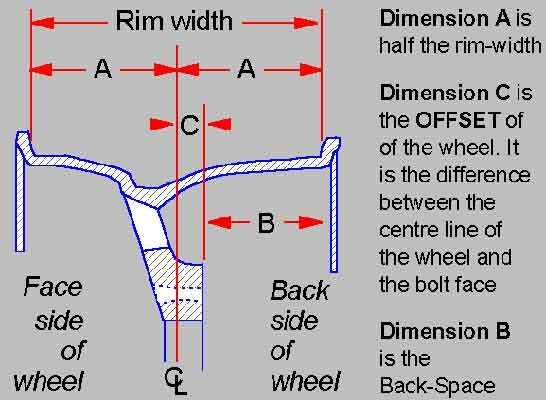 Let's do the offset, when you do this we want to use the true outside wheel width because we are looking to see if the wheels will fit. Now let's get center by dividing by 2. Now lets find the back spacing first. Offset is +15mm so we will add 15mm to the center for the backspacing figure. Last is front spacing, just subtract 15mm from center. Then lets convert the back and front spacing back to inches since I'm sure you measured what will fit in inches and not mm. Check this with your measurements for what will fit your car and if these numbers for the wheels are smaller then it will fit! Also for the front spacing the difference in that number will determine your fitment on how flush you are. If the wheel front spacing is bigger then what will fit you'll need to roll and pull your fender. Now I can get more technical by showing how camber will effect things because with the right size wheel/tire combo and the right amount of camber you could start hitting in other places then your trailing arm. However I doubt your looking at a monster tire or -10 camber so this wont effect you. Just found this diagram, thought I might share it on here even though I'm a little late with it. Oh. I was just saying if you're running pretty wide wheels and looking for the stance/hellaflush look. It wouldn't be too bad to get into negative camber. Cause if your offset is too high, there's chances of hitting the inner fender well. But that's at a really big extreme. Here is my other diagrams as well good sir......both of these are very helpful as long as everyone reads through them and understands the material as well.